So, you want to play a game and kill a few minutes or hours. But you don't want to spend any money, or install Steam (which can be a bit of a resource hog). You have two choices: Either play something in your browser, or grab one of the many fun and free Indie games offered on the Web. If the latter sounds more attractive, Game Downloader is a free and lightweight application that can help you find and legally download fun, free games. Game Downloader lists lots of information about each game, and includes a direct link to YouTube for watching game-related videos. You can get Game Downloader as an installer or a portable application requiring no installation. Both the installer and portable application pop up a UAC prompt asking forAdministrator privileges before running. When you run Game Downloader, it opens a single compact window with a black background. Other than the odd choice of color, other controls are standard--just like any other Windows utility. There's a search box, but it only works if you know the exact name of the game you're after: For example, searching for "hedge" yields no results, even though Hedgewars is one of the games listed. There is a Category drop-down letting you narrow down the selection to the type of game you're after, such as turn-based games, racing games, puzzles, and even music-based games like Frets on Fire. Once you pick a category, you can browse through the list of games. 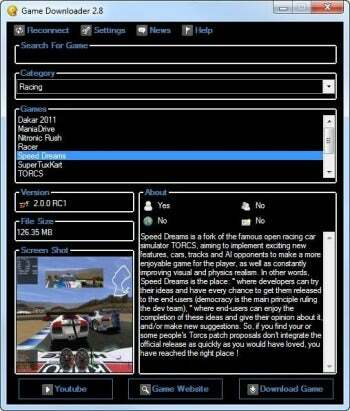 Game Downloader lists each game's version and file size, and includes a tiny screenshot and a text description of the game. There are also icons showing whether the game supports single-player mode, multi-player mode, or online play, and whether it requires a user account. Since Game Downloader provides dry technical information about each game, it's not easy to pick something good. That's where the YouTube button comes in handy: Click it, and your default browser will load YouTube with a search query for the game's name. More often than not, you will find in-game videos, tutorials, and demos showing what you can expect if you download it. Finally, there is the Download Game button, which grabs the game archive or installer. Unlike Steam, Game Downloader doesn't try to be a library. It downloads the game for you, but you step through the installer yourself (if the game has one). Game Downloader doesn't come with many bells and whistles, but it's an effective catalog of free Windows games. I only wish it had user reviews like those in the iOS App Store or Google Play. Instantly download dozens of free games for Windows with Game Downloader.